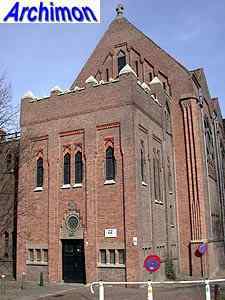 The French Benedictine monk and architect Paul Bellot was born in Paris on the 7th of June 1876. As the son of an architect he was destined to become an architect himself, and in 1900 he graduated at the Paris school of arts. However, after a short architectural career he decided to become a monk and joined the Benedictines of Solemnes in their exile at the Isle of Wight. As a monk with architectural skills he was soon asked to design the new Quarr Abbey as well as a new abbey in Oosterhout, the Netherlands. To coordinate work on the latter, he lived in the Netherlands from 1906 until 1909 and in those years learned to work with bricks. In 1914 he returned to Oosterhout and began an architect's office. In 1922 he employed H.C. van de Leur who became his successor after Bellot returned to France in 1928, where he began a new office in Wisques. He built several more churches and monasteries in France, Belgium, Portugal and Canada and died in the latter country in 1944. 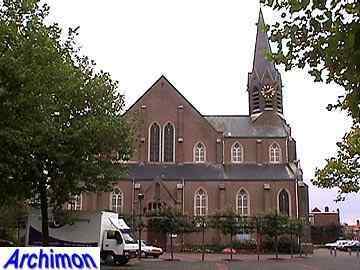 In the Netherlands Bellot built a small number of churches and chapels, as well as several other buildings. Although his Expressionist work was met with some hostility by more Traditionalist architects, his style influenced several other Dutch architects, including P.J.J.M. Cuypers and his father J.Th.J. Cuypers. The following is a list of Bellot's work in The Netherlands only. A more extensive site about this architect can be found here. Abbey built for a French monastic order in exile in The Netherlands. Between 1914 and 1928 Bellot lived in this abbey, where he had set up his architect-office. 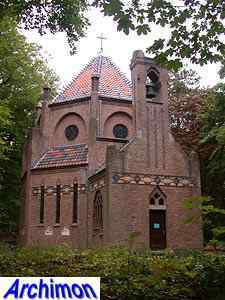 A church designed for this monastery was never built, although Bellot later used some of his ideas for the church in Waalwijk. A small village-church designed in conjunction with H.C. van de Leur. Octagonal chapel on a cemetary. Nowadays a Buddhist temple. Chapel of the Augustinian monastery Mariënhage. Designed in conjunction with J. Hegeman. 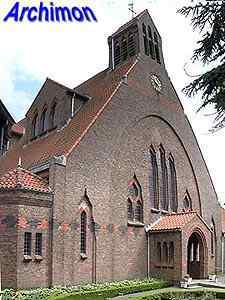 A very unusual way to enlarge a church; in a matching style a new church is added diametrically opposed to the existing neo-Gothic church. This was the first and only time Bellot designed in the style of neo-Gothicism, although elements in a more recognizable Bellot-style are present at the entrance and the apse. Church designed in conjunction with P. Cuypers jr.. Bellot used some of his ideas for a church in Oosterhout in this design, most notably the apse of the choir. 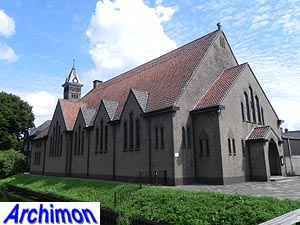 The only church Bellot built in concrete in The Netherlands. Designed in conjunction with H.C. van de Leur. 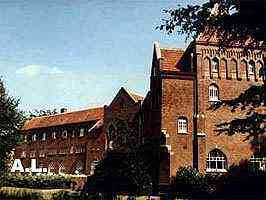 Demolished in 1993. 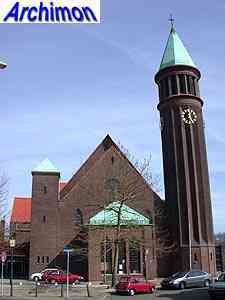 Church designed in conjunction with H.C. van de Leur. 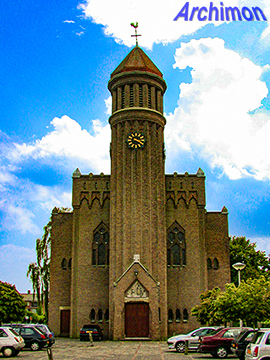 Church designed in conjunction with H.C. van de Leur. Tower very similar to that in Waalwijk, Besoyen.